Re: 85 camaro 400 sbc swap!? They are both going to be a 2 piece rear main seal small block chevy V8s so swap away. Everything except the rotating assembly should swap over. You'll need a 2-pc rear main seal flywheel for 82-85 Camaro/Firebird, unbalanced to the stock 400 spec. (about 24 oz-in, with the heavy place in line with the weird shape of the flywheel flange on the crank) And of course, since it's a MUCH larger engine internally than your 305, everything related to FLOW will need to be correspondingly larger: exhaust most especially. Your 305 exhaust will totally choke it. You will have to do ONE thing to it though, BEFORE putting it into the car. It has to do with the fact that the flywheel you will have to use, will be 12.8" diameter, but the 400 block is almost certainly only drilled with the starter bolt hole pattern for 14" wheel. Which means, you will need to have the later-model bolt hole added to the block. Without that, there is NO WAY to bolt up a starter that will work with that combination. This is a 400 block I drilled back in about 87 or 88 or so, when I put it into my 83 L69 car. You will need to have the same thing done. The add'l bolt hole is just about 5/8" closer to the crank; necessary because the flywheel has about a 5/8" smaller radius than the one the 400 block's bolt holes are set up for. I thought that's why most aftermarket starters that have the big fat aluminum mounting block are drilled for two sets of holes? They do indeed; but in order to use the set for 12.8" flywheel, the block must have the corresponding set. Think about where the bolts are. They are right next to the starter drive, on either side. Right? So, if you can imagine leaving a bolt in the inner hole, and somehow moving the drive over about 5/8" closer to the crank, what would happen? What would happen is, the bolt that is in that hole, would then have to go RIGHT DIRECTLY THROUGH THE MIDDLE OF the starter drive. 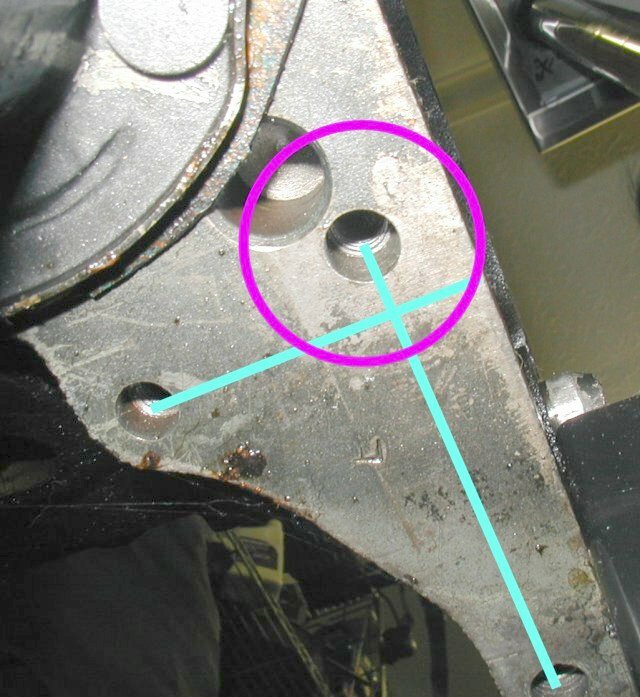 The problem isn't "the starter"; it's the location of the INNER BOLT. That's why there needs to be a bolt hole about 5/8" closer to the crank, to fit ANY starter that locates the drive 5/8" closer to the crank. NO starter can possibly overcome a bolt trying to go through the middle of the drive. Except maybe one of those bolts that has an offset in it... but the store that had those, along with the drill bits that drill square holes, and the spacers that make things THINNER instead of THICKER, closed some years back and I don't know where to get stuff like that anymore. Since the mid 90s I've had one of those dual-pattern starters on my car... it's one made by CVR, a Nippondenso unit. It wouldn't work AT ALL without the addl bolt hole, because it doesn't even have the offset one (the far left hole in my photo). Only the holes along the bell housing flange that are in a straight line with each other. thank you very much for the info!!!!! i appreciateit very much!!!! From another forum, I might have a solution to this. I don't know for sure, so Sofa please look into this. I am sending you the link in a PM. I think you can view it without signing in. If somebody has figured out a way to do it, like if maybe some starter has appeared that is small enough in the appropriate place that the bolt can pass through without interfering with its drive, that would be cool. I'd have to see it to believe it. My engine swap thread. 305-400 sbc swap. Quick Reply: 85 camaro 400 sbc swap! ?